A wheelchair user said she was refused entry to a nightclub by a bouncer who said the music was "too rowdy" for her. 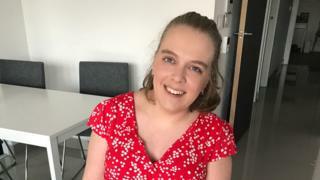 Lucy Webster, 24, a BBC journalist, tried to get into Aquum - a wheelchair-accessible club in south-west London - on Saturday night. Aquum said it "deeply apologises" for what would seem to be an "error of judgement" by third-party contractors. Lucy was in a bar with two friends - one who is her carer - in Clapham when they decided to continue on to a nightclub. "This is where it starts to get odd," she said. "The bouncer informs me that the physical access is fine, but the club is busy and he just wants to 'keep me safe'. 'I'm used to busy,' I say, 'I live in London. And anyway, I can look after myself'." She said a doorwoman then came over "to tell me the music was 'too rowdy' for me - as if, as a disabled woman, I can only listen to girly pop and, presumably, very sad songs." She was told it wasn't, because wheelchair users were often let into the club. A heated discussion followed, which Lucy says included the door staff suggesting that she could go inside by herself to see that the club was unsuitable - despite earlier being told it was unsafe for her to go in. "I just wanted to get out of there", she said, and they headed to a takeaway because "sometimes you just give up and get chicken". "I ended up feeling pretty sad," she said. "You feel like you don't belong in that environment - even though you know that you do. "It hasn't put me off because I'm stubborn, but it could put off others. "Finding somewhere accessible on a night out is hard enough to start with - you're very limited where you can go. Even in London, it is genuinely hard to find somewhere to go." Managing director of Aquum, Terry Georgiou, said: "I need to investigate this unfortunate incident further to ascertain all the facts, but it would seem that one of our third-party contractors has made an error of judgement on the evening in question for which I deeply apologise. "I will be calling a meeting with our third-party supplier and appropriate action will be taken." He added: "It was not our intention to cause any upset although I can see that it has... We will endeavour to ensure that such an incident never happens again." Lucy said: "I'm glad Aquum apologised and that they are retraining their staff. I don't think my friends and I will be going back but I hope other wheelchair users have better experiences in future." "Disabled people deserve to be seen as more than their impairment or condition and should be able to enjoy a night out clubbing without encountering this type of bizarre and discriminatory behaviour. "All too often disabled people tell us they face unfair accusations of being too drunk, or that their very presence makes them a fire hazard."